I think many of us, no matter how traditional or unconventional our families may be, feel that the cultural pressures placed on Latina women are unique. I mean, for all of my parents’ urging to “think for myself” and “subvert social structures,” I was also raised to believe I should never–never–leave the house without lipstick y arretes. And the first thing my mother says to me, almost every time she sees me, is: you look like a desechada. (She’s mortified that I wear my hair wavy, instead of ironed and “neat.” We are supposed to be attractive and put together at all times, creating what Jasmin calls a culture of “look but don’t touch” that’s confusing for men and women alike. I recently read an article in Mother Jones about a new book called Disney Ate My Daughter by Peggy Orenstein. In it, the author comments on the number of young girls who wear lipstick and mascara, wondering “why that percentage isn’t zero?” I admit – this took me aback. I’ve written before about how much I want to raise a daughter who doesn’t feel she has to grow up to follow any kind of pre-written script about what it means to be a woman. But when she she sees me putting on lip gloss and asks for un poquito, I let her. And she’s two. But some of my fondest childhood memories are of sneaking into my mom’s makeup to try it for myself. And putting on my make-up in the morning is one of the best parts of my day – I genuinely enjoy it. But is this a problem? Or, maybe a better question is, when does this become a problem? 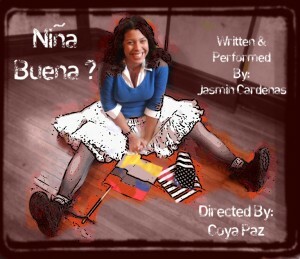 And how do we find balance between being mujeres modernas and mujeres buenas (the grown up version of the niña buena)? Do we care? Do we bother? If you want to know Jasmin’s take on it, check out her show Niña Buena? – a funny and sometimes genuinely tear-inducing look at these questions. It runs January 4, 5, 6 at Links Hall. Tickets and info here. And in the meantime, tell us your thoughts on the niña buena phenomenon.